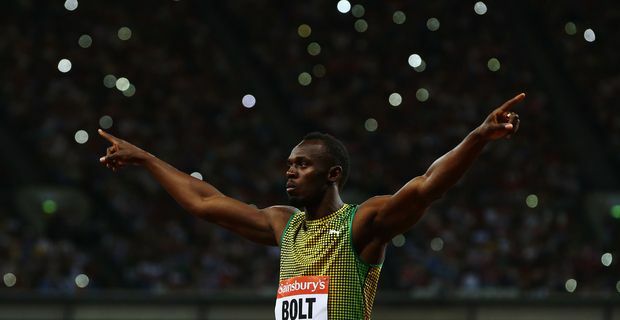 Usain Bolt was the undeniable star attraction on the first evening of the Anniversary Games in London. The Diamond League meeting marked a year since the London Olympics and Bolt ensured a sellout crowd was there to witness him winning the 100 metres. Bolt has been a little short of form over the shorter sprint distance this seaon, but still managed to run 9.85 seconds despite getting an appalling start. There seems nobody capable of challenging him in the world championships in Moscow. "The start was horrifying," Bolt said afterwards. "I think I was just race-rusty. I needed to get a few races in. My coach keeps reminding me that I'm not a good starter, so to stop worrying about the start and go when the gun says go is the plan." There was 0.22 of a second difference between Bolt's time in the London Olympic final and the time he managed on the anniversary, but Bolt has a habit of saving his best for the races that matter. This race was a gentle warm-up for the world championships, although Bolt admits the atmosphere did get to him. "For the first time in a long time I was slightly nervous," he said. "Initially I was excited because I knew it was going to be a big crowd but, when I saw the stadium was ram-packed and still like the Olympics, it was like 'Wow.' I love the energy of the crowd. It was beautiful." Bolt knew that the focus was even more intense after recent positive drugs tests for two of his rivals. "I try to uplift the sport," he said. "I try to do great things, extraordinary things to put the sport in a good light and that's what I'm here for. Bolt, ever the charmer, made a point of blowing kisses to the crowd and kissing the track. The crowd loved him back, although some were disappointed that Britain's latest young sprint hope James Dasaolu pulled out of the race with a hip flexor twinge just before the start.